September 26th, ASBM held a 2-hour Continuing Education (CE) course for Rhode Island pharmacists. 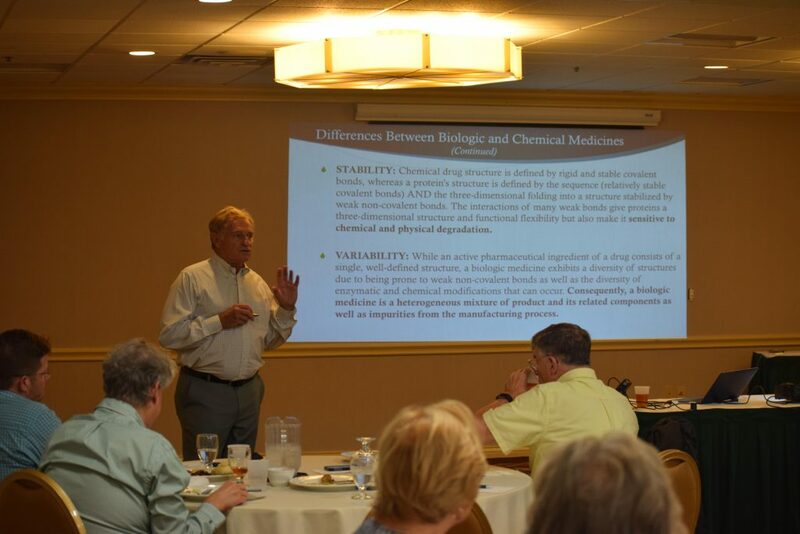 The course was presented in conjunction with the Rhode Island Society of Health-system Pharmacists (RISHP) and the University of Rhode Island College of Pharmacy. The course began with remarks from RISHP’s Raymond Iannuccillo, PharmD, an oncology research pharmacist with Rhode Island Hospital, who introduced the leader of the session, ASBM’s Advisory Board Chair, Philip Schneider FASHP FFIP. In addition to recently completing a term as Vice-President of the International Pharmaceutical Federation, Dr. Schneider is past president of the American Society of Health-system Pharmacists (ASHP), the national organization of which RISHP is a state chapter. Dr. Schneider began the presentation with learning assessment questions designed to gauge the audience’s general knowledge about biologic medicines and biosimilars. For example, he asked the audience how many biosimilars were currently approved by the FDA. The majority of the audience guessed that it was around 4. In fact, there are currently 12 approved. This increasing speed at which biosimilars are being approved, Schneider noted, emphasizes the importance of education on biosimilar policy issues which can affect pharmacy practice. He also compared the number of FDA approvals with the number of approvals in Europe, Canada, Latin America, and Australia. Schneider then gave an overview of biologic medicines – what they are and how they are used, following by a definition of biosimilars. He explained that the greater size and complexity of biologics, as well as the fact that they are produced in living cells means that unlike generic copies of small-molecule drugs, biosimilars are not exact duplicates of their reference products. These inherent differences, he continued, can potentially result in unexpected effects including unwanted immune responses or reduced efficacy. Next Schneider discussed the biologic approval process, and difference between that pathway and the abbreviated biosimilar approval pathway. Schneider noted that the latter’s emphasis on analytics over clinical trials shows the importance of good pharmacovigilance and clear product identification in gathering real-world evidence about how these agents work in large populations. Distinct nonproprietary names, Schneider argued, will be key in ensuring that medicines are accurately tracked and that any adverse events are attributed to the correct product. He shared ASBM survey data from physicians and pharmacists showing strong support for distinct names, and discussed the FDA’s distinct suffix system for biologics, and efforts by the WHO and others to advance a global distinct naming standard. Finally, Dr. Schneider turned to the subject of biosimilar substitution. In the US, Schneider explained, the FDA permits pharmacists to automatically substitute a biosimilar deemed to be “interchangeable”- one that has demonstrated that is produces the same effects as the originator without additional risks relative to having remained on the originator. Still, he noted, 45 states and Puerto Rico have passed legislation permitting biosimilar substitution, but requiring pharmacists communicate to the prescriber which medicine was dispensed. In addition, prescribers in these states retain the right to prevent such a substitution. Dr. Schneider discussed the evolution and progression of this legislation since 2013; including initial resistance from many state pharmacist societies, and how the various stakeholders came together to craft compromise legislation and build a collaborative approach to pharmacovigilance. View Dr. Schneider’s full course presentations here.